Ryan Melendez has been ﬁghting Leukaemia for quite some time; now 18 years old, he has been fighting since September 2015. The disease can make you feel awful, the chemo can make you feel awful and for some, maybe the unfairness of life might make one feel awful. However, Ryan found that what made him feel better – what became a healing presence for him – was being with his horses and working at feeling good enough to enter the show-ring with them. And far from feeling life was unfair, Ryan came to an epiphany. What about kids who had cancer and didn’t have a horse to help them like he had? Welcome to Warrior Horses. Ryan developed a programme to match kids with paediatric cancer with Arabian horses. 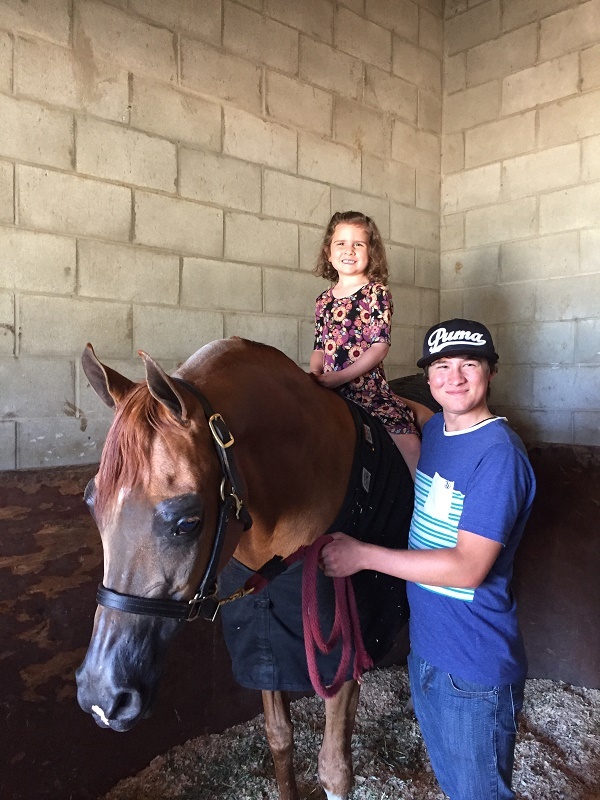 Ryan describes how it happened: “When I was in the hospital for the ﬁrst month of cancer treatment, the Arabian horse community surrounded us with such love and support. Every day, I received mail in my hospital room… Cards, letters and encouragement from countless supporters. I had the thought of wanting somehow to share this with the other Warrior Kids stuck on the hospital ﬂoor. Kimi, one of Ryan’s Warrior Friends. She is getting matched up with a Warrior Horse. “Fast-forward to me being nominated as Leukaemia/Lymphoma Society (LLS) Man of the Year and being responsible for fundraising for cancer research. This was the perfect time to set up a programme to bring the spirit of the Arabian horse to countless children ﬁghting against cancer. A way for them to escape the walls of their hospital room or the isolation they often feel being at home. The battle against cancer is often long, and often a result of the extended duration can be the loss of friends. So, having a connection to a Warrior Horse and getting updates, photographs, and correspondence with the owners/riders allows my fellow Warrior Friends to get the support and friendship the Arabian horse community afforded me. “The idea is to raise money for paediatric cancer research and 100% of the funds goes directly to the cancer researchers. Each horse that registers is given a fundraising page which will help spread awareness about childhood cancer and to raise money to ﬁnd a cure! Once the horse/owner raises $1,000, their horse becomes a Warrior Horse. The idea is to match a Warrior Horse to a Warrior Kid close to each other, in the hope that the child can go visit their Warrior Horse and can then continue to follow along their horse’s journey throughout the year. If it happens to be a show horse, then they are able to watch their Warrior Horse compete at shows that feature live feed. Warrior Kid Charley and her Warrior Horse Imagine Fame+++/. Currently there are 150 horses registered with over 50 Warrior Horses so far. The goal is to register 500 Warrior Horses. They don’t have to be a show horse to qualify, and the power they can have on their Warrior Kid can be dramatic and heart-warming. Ryan gave a few examples: “We have done a few matches in our area with my fellow Warrior friends and it’s been amazing to witness. 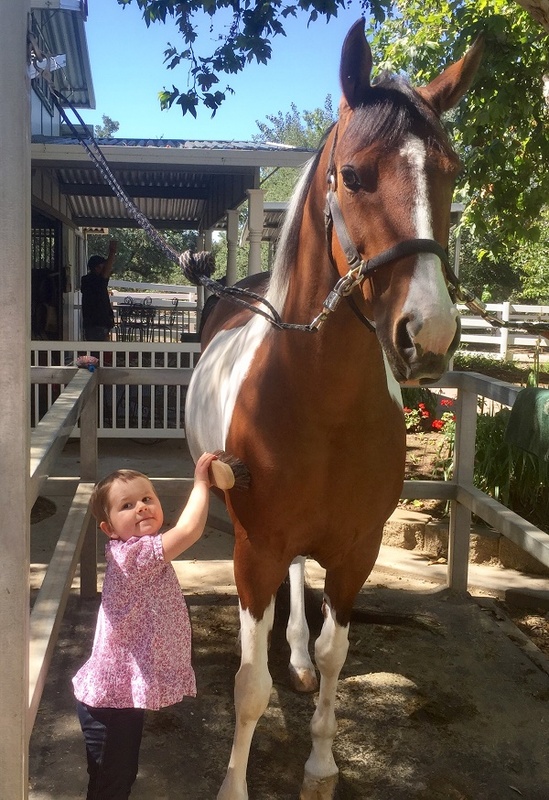 Charley is a four-year old Leukaemia warrior kid who had never seen a horse before. When she was matched to Imagine Fame+++/, aka ‘Bean’, she had the biggest smile on her face! The joy that she and her family experienced was something extraordinary and to this day, Charley gets updated on her Warrior Horse and talks about Bean all the time. “During the Region 1 horse show, we brought a group of Warrior Kids to visit the show and see horses. Some of them had never seen a horse let alone feed them a carrot. It was remarkable to witness Arabian stallions become the most docile creatures when a young cancer child approached them to touch their faces. Again, the joy and smiles all of these children had on their faces was priceless. Paediatric cancer patient Layla with Ryan and her Warrior horse, US National Champion LD Pistal. Ryan credits bringing along his young home bred and trained horse, the half Arabian Khing of Diamonds, to success in the show-ring, has only intensiﬁed his determination to be a winner outside the show ring as well. “My competitive nature has been able to be fulﬁlled through showing,” Ryan said. “It has taken my mind off cancer by being able to ‘win’ at something again. I have the ability to take back some of which cancer took from me. Showing Arabian horses has always been a part of my life and it gives me great joy to be connected with my horse when we show together. Ryan was indeed named Leukaemia/ Lymphoma Man of the Year for his work!